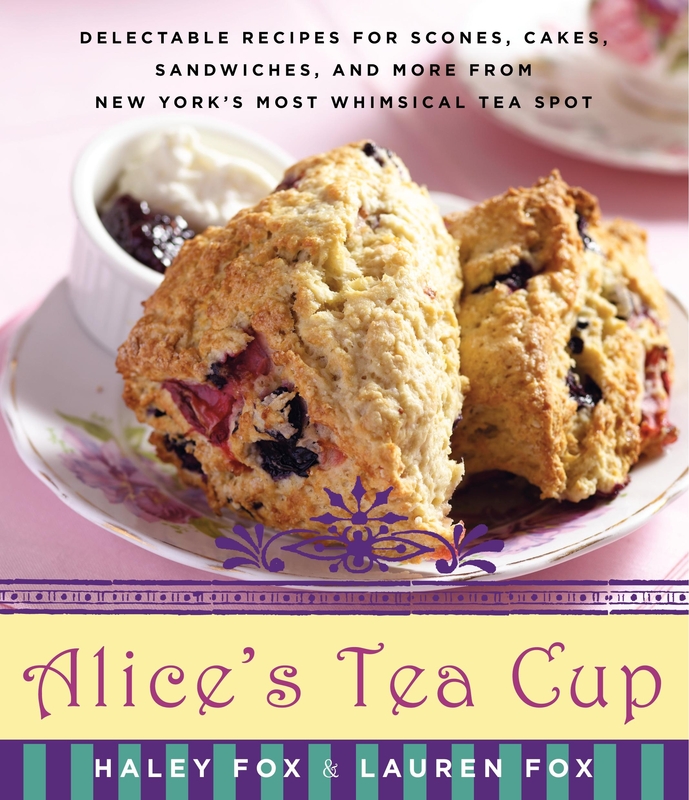 Alice’s Tea Cup Takes Cookies & Cream to the Next Level! One of my all-time favorite food partnerships is cookies and cream. The chocolate crunch mixed with the sweet cream is delicious in all capacities, but the glorious Oreo cookie is probably the most famous for this delightful flavor combination. As soon as I saw the recipe for Oreo Cupcakes in Alice’s Tea Cup by Haley and Lauren Fox, I knew I had to make them. Since December’s Ingredient of the Month is flour, chosen by the author of The Cake Bible, Rose Levy Beranbaum, it was the perfect opportunity to try these decadent treats. I did have some trepidation because I’m not a very accomplished baker, and flour is not an ingredient that I use often, but I followed the directions closely and was thrilled with the results! These cupcakes start with the Fox sisters’ Chocolate Cake recipe, which they say is “the best chocolate cake ever—no contest.” That’s a bold statement, but after making these cupcakes and consuming far too many, I must agree. What makes them so special is how incredibly moist they are (thanks to the coffee in the batter). Once the cupcakes are cooled, the tops are sliced off and a scoop of Marshmallow Fluff is nestled into the middle of each little cake treat. The recipe suggests that you use a melon baller to deposit the Fluff. I think that is a fantastic idea. I do not own this particular tool and used an ice cream scooper, which proved to be slightly difficult since the Fluff is so sticky—but it all worked out. You then put the cupcake top back on and frost it with Alice’s Yummiest Vanilla Buttercream Frosting. The pièce de résistance is that this cupcake calls for folding Oreo cookies into the buttery vanilla frosting, adding another dimension of both chocolate crunch and that unmistakable sweet white Oreo filling flavor. These cupcakes were everything I could hope for and more—a cookies and cream lover’s dream treat! It’s universally known that you get a free pass during the holidays to indulge in baked treats—so use your free pass and enjoy! 2. Fill a nonstick muffin pan or 12 cupcake cups half- full with the batter, and bake for 15 to 20 minutes, or until a toothpick stuck into the middle comes out clean. Set aside to cool completely in the pan. 3. Use a paring knife to scoop a ½-inch-deep cap off the top of each cupcake. Set the tops aside; you will need them in a minute! 4. Use a melon baller to deposit a heaping scoop of Marshmallow fluff into the center of each cupcake. Set the tops back on the cupcakes. 5. Use a spatula to gently fold the Oreos into the frosting using an offset spatula, carefully frost each cupcake with a very hearty amount of the Oreo frosting. Seriously, we’re not kidding—don’t hold back! 1. To make the cake, preheat the oven to 350°F. 2. In a large bowl, sift together the sugar, flour, cocoa powder, baking soda, baking powder, and salt. 3. With a mixer on medium speed, add the sour cream, eggs (one at a time), milk, oil, and vanilla to the dry ingredients, and keep mixing for exactly 2 minutes. Scrape down the bowl. With the mixer on low speed, slowly drizzle in the hot coffee, mixing until the batter is blended and smooth. It will be very liquidy—this is good! With a mixer on medium speed, cream the butter in a large mixing bowl. Reduce the speed to low and add the confectioners’ sugar a little bit at a time, alternating with splashes of the milk and the vanilla. Mix until the frosting is smooth. Wow! Fresh brewed coffee in the cake. Interesting. I want to try this when I can. I’ve used sour cream in baking before, but not coffee.